Viber is an application developed by Viber Media Inc. specially for iPhone and Android users so they can use the voice communication function or we could say calling and also text message or chat messenger free, by using 3G data network or WiFi. This application can be downloaded freely from Google Play Store and iOS App Store. For registration it’s also really easy. Just like when you register on What’s app. It’s purely based on your phone number. Without email request or using special PIN. When you can download it freely, the developer of this application is also promises the quality of the voice will be just like when you’re using GSM network without using some advertisement which usually comes on the screen when you’re using free calls application. 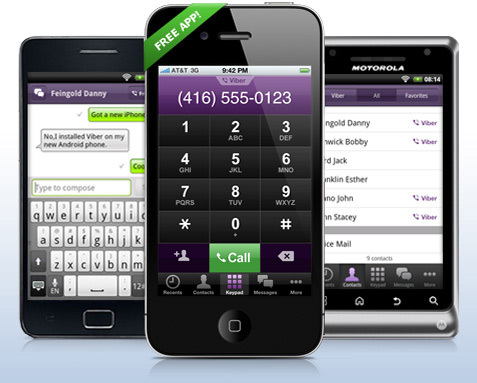 It can also be used to make international or interlocal calls without any charges. Just like what i said before, unfortunately for now Viber App are only available for iPhone and Android devices. The developers do promise that this application will also be allocated for BlackBerry (Viber App for Blackberry) users as soon as possible. Unfortunately, when you can see all numbers from your contact list on your Viber, it doesn’t means that you can call all the contact who haven’t use Viber yet. Because when the contact you’re called haven’t use Viber, the call will be directed on normal phone number, the charged one. Free call and text local or international without reducing your credits. Viber don’t need registration, username, or password, it will automatically detect all numbers on your contact list, and when they install Viber on their phone. You can directly text or call freely on that numbers. Other than 3G Viber can also be used with WiFi connection. Viber are definitely will become useful for Android and iOS users who have family or friends out of the country, so the communication cost will be much more cheaper than what you usually need. You’ll only need Android or iOS gadget and 3G data connection of WiFi. Or you can use application such as this one which I have posted before. With Skype to make free call and video freely.